All around me right now, I witness pure, unadulterated perseverance. I watch baby Charlie climb the same step every day, to fall off, every time. He keeps trying, and one day, he won't fall off. That day is not today, hilariously. When my mum had her cardiac arrest, they didn't quit giving CPR after 30 seconds. They kept going. 2 minutes, 4 minutes, 6 minutes - until her heart began to beat again. In classes and PT sessions, I watch people who have no fitness or mobility progress into fit, strong, mobile individuals. Every day in my work I watch self-doubt become self-belief. The one thing that all of these acts of perseverance have in common? Nobody taking part had any idea how long they would need to stick at it. The greatest successes in this story are those who kept going, even sometimes when the odds seemed stacked against them. Just because the end may not be in sight, or it may not be tangible, does not mean it is unreachable. The key to perseverance is simply not to stop trying. Success is incidental, and to an extent can even become incremental. We all go through phases where we want to give up. 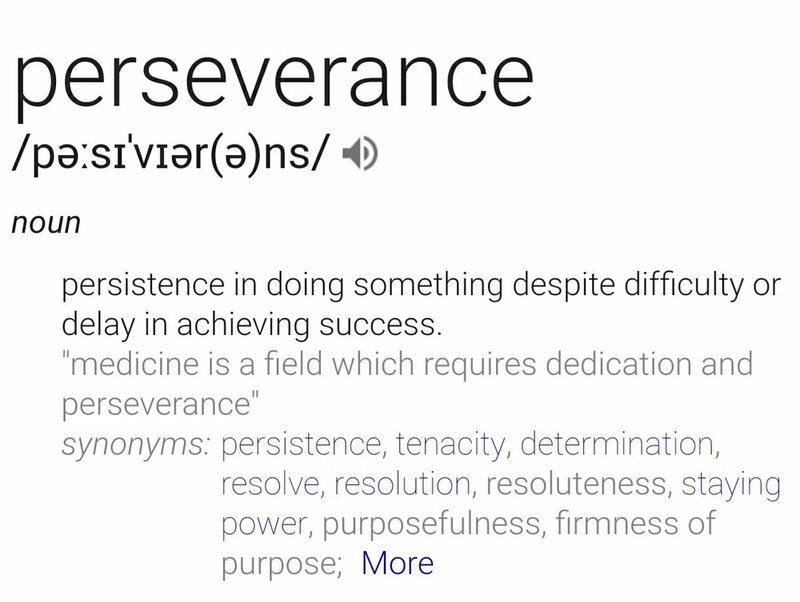 Perseverance is as much about not giving up as it is about keeping going. Have a break if you need to; we all get tired. Take stock if your brain needs to rest; reset your mental buttons. Ask for some damn help and don't be ashamed. When you know everything counts on you continuing, you need to keep going. Sometimes, it's right to step back and quit. Strength can be found in knowing which battles must be fought and from which we should walk away. To persevere, all that you need is the belief that one day, you will do it. As much as it is hard, as much as it is thankless; as much as you might be torn between loving it and hating it (whatever it might be). Your greatest achievement could be realised just because you tried again, one more time. Perseverance just requires that you show up. Again.